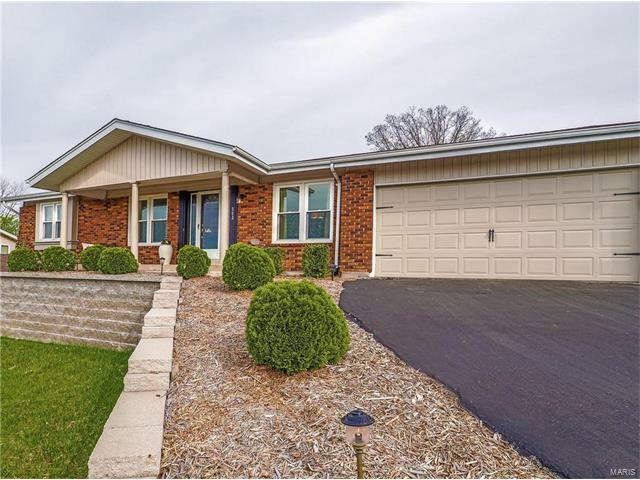 Beautifully Maintained & Totally Updated 4 Bedroom Ranch on Nearly 1/2 Acre Lot. Spectacular View From the Covered Front Porch. The Gracious Entry Opens to the Living Room & Separate Formal Dining Room. Spacious Family Room w/Remote Gas Fireplace & New French Doors Leading to the Beautiful Stamped Concrete Patio & Picturesque Yard. Beautiful Hardwood Floors Grace the Breakfast Room & Updated Kitchen with 42 inch Cabinets, Granite Counters, Large Pantry & Custom Cabinet Lighting. Master Bedroom Suite Offers Walk in Closet w/Built-ins & Private Updated Bath. There are 3 Additional Bedrooms, One with Built-in Desk. Updated Hall Bath. The Main Floor Laundry is Conveniently Located Off the Kitchen. The Lower Level is Partially Finished-Just Waiting for Your Finishing Touch, There is also a Huge Utility/Workshop Area w/Sink. Central Vac, Freshly Painted Interior, New Vinyl Siding, Beautiful Landscape Lighting, Subdivision Pool & Lake. Wonderful Location. Just Move in and Enjoy!